"b collection’s Crackle Top Coat is your essential tool for express nail art! Available in black or white, Crackle Top Coat lets your fingers do the talking with a show-stopping cracked finish. Achieving an on-trend nail art look is easy. Simply apply Crackle Top Coat over your favourite b collection nail polish shade and watch as the top coat contracts and shatters appear - allowing your base shade to peek through." Crackle Top Coat in white has a somewhat unusual formula. It's somewhat on the thin side but also a little gluggy which sounds extremely strange but the only way I can explain it! It applied well though and crackled quickly into thickish cracks. Here I've applied 1 thin coat to my previous Essie Van D'Go NOTD. It dries to a satin finish and I haven't applied topcoat in my pictures. I actually usually prefer my crackle/shatter manicures without topcoat as I like the roughish texture. 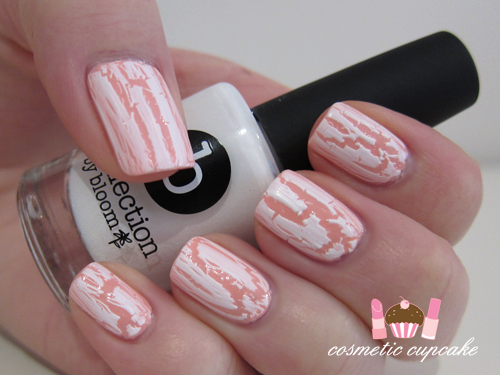 Overall: I love that b collection have made crackle polish a lot more accessible to everyone now! Your everyday nail polish lover (ie non polish crazed ladies!) may not know about other brands like OPI, China Glaze etc that have crackle but b collection is readily available at Target stores and at a much lower price point which is excellent. Polish wise, it crackled well and looks great. This is the first white crackle I've tried and I like that it's nicely opaque. Details: b collection Crackle Top Coat is available now in black and white exclusively from Target stores Australia wide for $12.95. I think it looks a little like candy? I showed my aunt these crackling polishes and she just couldn't understand the point of it hehe! @Ayshlynn: LOL now that you mention it, it reminds me of peaches and cream too! Mmmmmmm now I feel like that haha. @rock-or-not: It is a lovely crackle I agree. I'm glad I have it in my collection! @Jen: Oh that's awesome that it's available in NZ! Did you get it? I don't have any nail care posts unfortunately. I actually don't really do too much at all with my nails.. bad I know! @тainтed мeмories. : I like how b collection crackle cracks too. It's a bit different! @Steph: That's such a great way of describing the look! Lol that's so funny but I think a lot of people don't "get" it either haha. @Monday Receptionist: Thank you so much!